The Chinese regime recently wrote off $78 million of Cameroon’s debt while Yang Jiechi, China’s top diplomat, visited the central African country on Jan. 18. But both governments and official media did not publish the news until five days later. Yang, who is a member of the Chinese Communist Party’s powerful Politburo, visited Cameroon as a special envoy of Chinese leader Xi Jinping. On Jan. 18, he met Cameroon President Paul Biya and made a series of cooperation agreements. But in the initial official reports by both countries, there was no information about the debts that Cameroon could not pay back to China in 2018—only the fact that Yang had visited the country. China is Cameroon’s biggest creditor, with more than half of its roughly $8.2 billion external debt owed to the Chinese regime. Then on Jan. 22, the Chinese-language version of the Wall Street Journal, citing an official statement from the Cameroon president, reported that the two sides agreed to reduce Cameroon’s total debts owed to China, with $78 million written off. After African media began reporting on the news, CGTN Africa, the international arm of China’s state-run broadcaster, published a Jan. 23 English-language report that Cameroon owes China almost $5.7 billion in total, and that the $78 million was the amount it could not pay back in 2018. 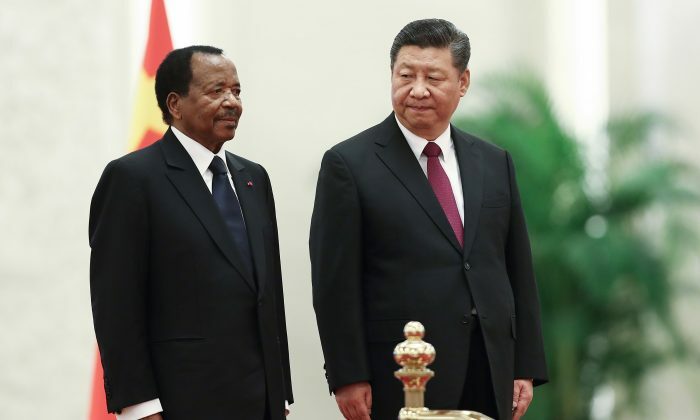 Journal du Cameroun’s Jan. 19 report noted that China is the primary commercial partner and biggest investor in Cameroon “in terms of development-oriented projects.” Furthermore, when Biya visited Beijing in March 2018, Xi had promised Biya that he would cancel Cameroon’s debts—meaning Yang had fulfilled Xi’s promise. In recent years, China has made significant investments in African nations under its One Belt, One Road framework for increasing geopolitical influence around the world. According to Cameroon’s Ministry of Economy, Planning, and Regional Development, China invests more than $400 million per year into the country’s infrastructure, telecommunications, stadiums, and housing projects. As the debt piles up, Beijing has also sought to gain access to the country’s natural resources. VOA reported on Jan. 21 that while Yang was visiting, about 60 Cameroonian miners were protesting outside a Chinese-run gold mine in a village named Ngoura. The miners told VOA that Chinese miners excavate on river beds, swampy areas, and around waterfalls that violate Cameroon environmental laws, but they bribe officials to allow them to do whatever they want. The miners pledged to bring guilty people to justice. Chinese loans to the African continent at large has increased dramatically in the past 15 years, reaching $30 billion in 2016, according to the China Africa Research Initiative based at John Hopkins University. While China’s foreign ministry spokesperson Hua Chunying admitted to CNN in early February that the debt forgiveness is true, the news has largely gone under the radar in Chinese media. This could be due to past negative reactions from the Chinese public to the regime’s Africa investments. In September 2018, when Chinese leader Xi announced that Beijing plans to invest $60 billion in Africa over the next three years, Chinese netizens left angry online criticism. They said that while millions of Chinese live in poverty with less than 2,300 yuan ($340) annual income and struggle to get help from Chinese authorities, Beijing is throwing money at Africa. Chinese censors went into action by deleting negative posts and utilizing its “fifty cent” army to post positive posts. The term refers to internet users the authorities pay off to post positive online comments about the Party’s policies.